iv) Use the lower of cost or market figures for inventory valuation on the financial statements (inventory numbers on the balance sheet). Under US GAAP, the accounting treatment of these 3 definitions of market is amalgamated together to find a ‘designated market value.’ In the table below, all 3 definitions including net realizable value, net realizable value minus profit margin and replacement cost are listed alongside the original purchasing cost. Then, the middle value of these 3 numbers is chosen as the ‘designated market value.’ For instance, if net realizable value was $110,000, and net realizable value less profit margin was $99,000 and the replacement cost was $105,000, then the designated market value would be the middle value which equals to the replacement cost of $105,000 in this case. 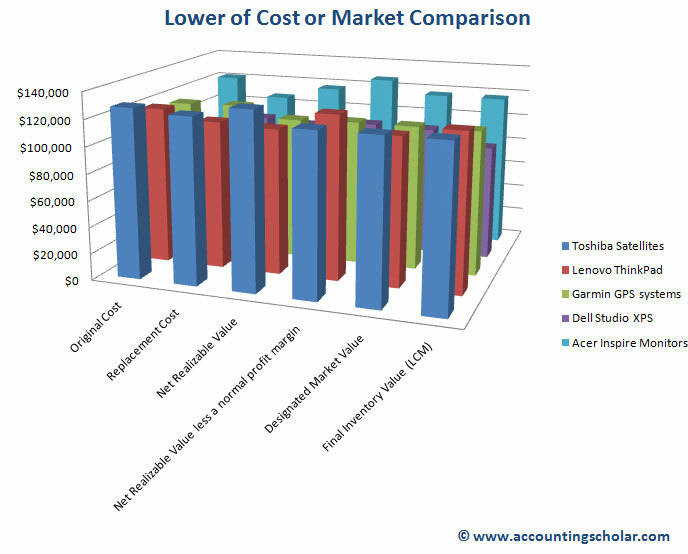 This graph above compares the Lower of Cost or Market for all the electronics types listed on the legend on the right. It compares the original cost, replacement costs, net realizable value and NRV less a profit margin, the designated market value (used in the United States only) and the valuation of final inventory balances.